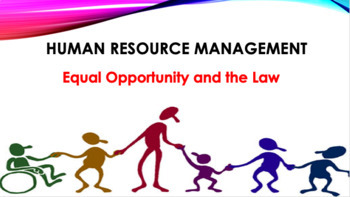 Equal Opportunity and the Lawis a lecture which is covered during Human Resource Management Module. The purpose of this lecture is to provide you with the knowledge to deal effectively with equal employment questions on the job. The main topics we cover are equal opportunity laws enacted from 1964 to 1991, the laws enacted from 1991 to the present, defenses against discrimination allegations, illustrative discriminatory employment practices, the EEOC enforcement process, and diversity management. A university recently fired its career services director after years of good evaluations. This happened about a year after his new boss gave him his first poor evaluation while peppering him with questions like “When are you going to retire?” The dismissed employee soon sued for age discrimination. We will see how to avoid such problems. 1. Explain the importance of and list the basic features of Title VII of the 1964 Civil Rights Act and at least five other equal employment laws. 2. Describe post-1990 employment laws including the Americans with Disabilities Act and how to avoid accusations of sexual harassment at work. 3. Illustrate two defenses you can use in the event of discriminatory practice allegations, and cite specific discriminatory personnel management practices in recruitment, selection, promotion, transfer, layoffs, and benefits. 4. List the steps in the EEOC enforcement process. 5. Discuss why diversity management is important and how to install a diversity management program. Once you will purchase this resource please leave a comment! **Please click on the star above to follow us!